A catastrophic earthquake can strike virtually anywhere. Communities on geologic fault lines, such as those on the West Coast of North America, are particularly vulnerable, but strong tremblors have hit in places located on solid bedrock, such as Quebec and Missouri. No matter where you live, it pays to be aware of the damage a seismic event can inflict on your home. A strong quake can easily knock your home off its foundation. The surface of the earth moves in complex ways during an earthquake, and the ground under your home may undulate both horizontally and vertically. An observer on the beach during the 1989 Loma Prieta quake in California noted that the sand quivered like a bowl of Jello. On the other hand, a homeowner in Japan reported being thrown vertically toward the ceiling during the 1995 Kobe event. It's a rare residential structure that can maintain its position and integrity during a strong earthquake. Most suffer at least some damage, depending on the ground characteristics, strength of the quake and amount of energy the owner has put into earthquake preparedness. Quakes typically last from 30 to 50 seconds, which isn't long, but it's long enough to strew items throughout the house, break pipes, shatter glass and create all sorts of other hazards. 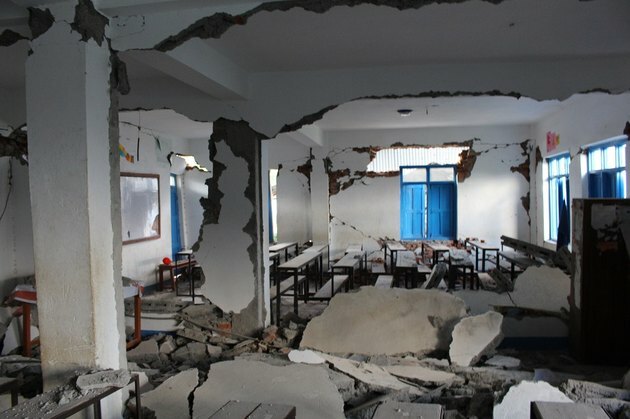 Brick and concrete structures can crumble during a strong quake. 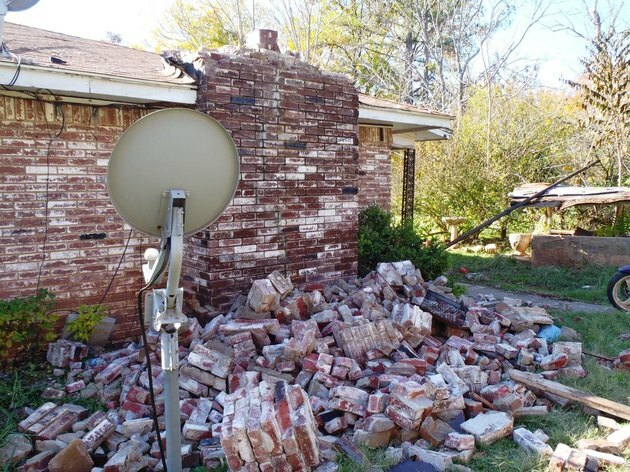 Perimeter concrete foundations and brick chimneys can crumble. Shear forces can bend or even break support members in post-and-pier foundations, causing part of the floor to collapse. Unbraced walls can tilt or even fall. If they are made of brick or concrete, they can crumble. A structure that isn't tethered to the foundation can slide off and tip precipitously. Without the support of the foundation, the sheer weight of the house can bend or break supporting beams, causing walls and ceilings to collapse. Even if this effect is minimal, the shear forces resulting from structural destabilization can shatter glass, break plumbing pipes, pull electrical wires loose from their connections and tip over appliances. Many wood homes have brick chimneys that can collapse even if the home sustains only light damage. Chimney repair pros were among the most active tradespeople in Santa Cruz, California for many years after the 1989 quake. What Happens Inside a House During an Earthquake? Shifting walls can fill a house with rubble. Video footage from inside buildings affected by the 2011 earthquake in Japan made one thing clear: Things fall. Items in Japanese offices and grocery store shelves wound up on the floor, and the same can happen to items in unsecured cabinets in any house that suffers a seismic event. The resultant debris adds to the already chaotic conditions in the shaking edifice. In an extreme event, falling light fixtures can be even more troublesome than piles of broken pickle jars from the kitchen cupboards. The light bulbs shatter when the fixtures hit the floor, and the wires in the electrical boxes to which the fixtures were attached can be exposed. Pictures fall off walls, and if the pictures are glazed, the glass can shatter and litter the floor. Bookshelves that aren't securely tethered to the walls can tip, and anyone in the way of the falling books can be injured. The windows are one of the biggest hazards inside a house during a moderately strong earthquake. 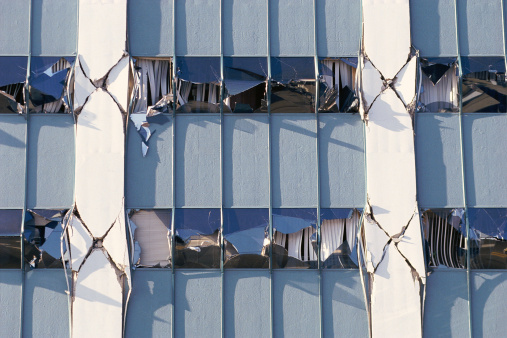 Any movement of a window frame puts stress on the glass, which can shatter violently and fill the air with dangerous projectiles. This won't happen, however, if the windows are fitted with safety glass. If you're inside when you feel the first vibrations of a quake, it's important to move as far from the windows as possible. The best place to seek shelter is under a table. Failing that, avoid anything that can fall on you, such as light fixtures or bookcases, and hunker down in place until the shaking stops. Fires are responsible for many fatalities after an earthquake. PEX plumbing pipes are flexible enough to remain intact during a large earthquake, but these are relatively new, and most homes don't have them. Instead, most homes have rigid PVC, copper or galvanized steel pipes, and these can break. The ones at ground level are especially vulnerable, and when a supply pipe breaks, or the water heater tips over, the resulting flood of water adds to the mayhem. Natural gas and propane pipes are more dangerous. Building codes in earthquake-prone areas mandate flexible gas lines, but some homes still have rigid steel pipes that can break. The resulting release of gas creates an explosive bubble that is easy to ignite. One of the lessons of the Kobe earthquake is that the resulting fires can be even worse than the quake itself. The wires in most homes run through the walls, and if the walls shift, the wires can disconnect from outlets, switches and light fixtures. This can make lights flicker and cause power outages.